How to bind / load/ fill gridview with sql server database in asp.net using both C# and VB.Net language. 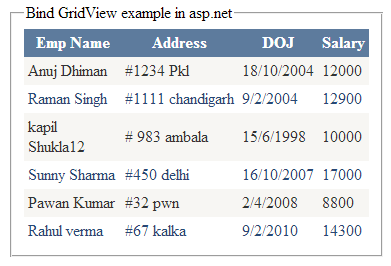 Reason and Solution: In previous gridview related articles i explained with example How to Bind,Save,Edit,Update,Cancel,Delete,Paging example in GridView in asp.net C# and Bind and Export GridView data to PDF file in asp.net and How to upload, download and delete files from GridView and How to bind gridview and highlight gridview row on mouse over. The above error usually occurs if you missed to initialize the SelectCommand property. Note: Read the full article for the complete working code to bind the gridview without any error. Implementation: Let's create an application to bind gridview from sql server database. In the web.config file create the connection string to connect our application with sql server database. Place a GridView control from the Data category of the visual studio’s toolbox.